BOOKMOBILE: A Tribute to Teaching and Learning. 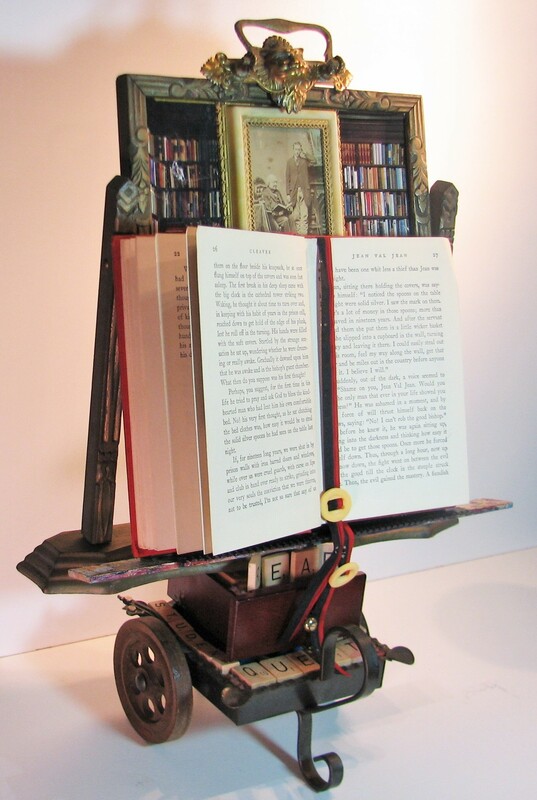 Reminiscent of the portable library, this assemblage includes a photo of Judge William Elliott standing beside “Daddy Hutton”. Hutton is reading a book – perhaps Judge Elliott’s Reminiscences, published in the early twentieth century. Hutton, a teacher of my father and uncles, was called “the father of education” in the pioneer village of Hyde Park just west of London, Ontario in the early 1900s. A much-used library card, a poem from The Old Farmer’s Almanac, and a replica time piece are mounted on an antique frame to which is attached a vintage brass lion drawer-pull. They sit on an old ruler and some of the inner works of a 1940s Remington typewriter. The whole assemblage moves when gently pulled. The drawer and wagon hold words made from scrabble pieces. A book mark is a typewriter ribbon circa 1940. The book is Solomon Cleaver’s 1935 Canadian classic Jean Val Jean.